Stage Screws are used to fasten flats or scenery pieces to the stage floor. 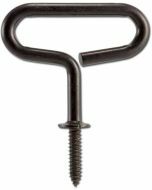 The Steel Stage Screw should be used when the screw must be used in the same place several times, or where exceptional holding power is needed. 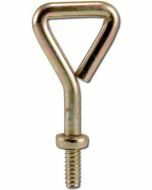 To use the Steel Stage Screw (not included), drill a 9/16" hole, screw the Stage Plug into the floor with a wide straight blade screwdriver, then fit the screw into the plug. 0.6" x 0.6" x 1.25"